Having come out on this blog nearly two years ago as a bit of a lapsed Titanic nut, discovering American academic Steven Biel’s wry and well-researched survey of the disaster Down with the Old Canoe: A Cultural History of the Titanic Disaster in an airport bookstore was a pleasant surprise. A completist run-down of the plethora of political and social interpretations, memorials, books, songs, movies, poems, art, propaganda, and other public reactions to the sinking of the largest ship then built on its maiden voyage in 1912, it demonstrates clearly and effectively that the dominate symbolic usage of the disaster in the subsequent months, years, and decades has been to uphold the traditional, conservative order of American society. Biel shows, with voluminous quotations from period newspapers and periodicals and other print sources, how what he calls the myth of first-cabin heroism became the conventional American public discourse’s primary narrative framing of the death of 1500 people in the freezing North Atlantic over a century ago. The observance of the “rule of the sea” that dictates women and children must be saved first, leading to the upstanding self-sacrifice of many very wealthy, prominent male citizens, was praised to the rhetorical heavens and taken as proof of the ineffable value of political and social concepts from Anglo-Saxon racial superiority to patriarchal privilege to Christian moral fibre to the persistence of chivalric good breeding even amongst nouveau-riche capitalists. Likewise, the selfless heroism of the men who stood aside (most of which, it should be noted, probably didn’t know that the ship was sinking as the lifeboats were being loaded and may well have acted with more of a self-preservationist instinct if they had) to let the weak be saved was taken as refutation of all manner of newfangled radical progressive ideas and movements. Ideologies like socialism and feminism were chief among them, proximal threats to the continuance of wealthy masculine privilege as they were in the immediate historical context of the event. Widescale immigration’s dilution of the WASP plurality also found expression in persistent if mostly unproven (and unprovable) eyewitness accounts of steerage passengers transgressing the boundaries of proper behaviour into panic and violence, only to be pushed back into their sinking bucket by the representatives of the white elite (sometimes with deadly force). The Titanic disaster was an object lesson in the value of that elite, most bourgeois voices claimed in its aftermath. Progressive campaigns for greater equality of opportunity for the workers, women, and racial and ethnic minorities were not merely irresponsible and destabilizing to society, they were also superfluous and unnecessary, this rationale held. Rich white Christian males are doing just fine running things and amassing an unequal share of the wealth, thank you very much; just look at how bravely many of them drowned for no particularly compelling reason! Inconvenient facts such as more first-class men surviving the sinking than third-class women were hardly a ringing endorsement of the essential benevolence of the privileged American elite, of course. The conservative elite’s declared enemies on the ragged Left certainly noticed. Their perspectives are revealed in the book as being the least-clouded in the wake of the tragedy, bluntly insistent that it was anything but a tragedy, or at least a much smaller and less deadly tragedy than the ongoing people-grinding mechanisms of industrial capitalism. Joining them in the chorus of criticism of the rose-tinted memoriums were first-wave feminists harumphing at the patriarchal assumptions of first-cabin males who sought to protect their defenseless damsels in distress, social-concern Protestant ministers bemoaning the materialistic greed and secular hubris that made anyone think that a ship could be unsinkable, and anti-modernists remarking on the costs of the runaway train of technological progress. Biel even tracks down African-American blues lyrics (one of which gives the book its title) and “toasts” completely upending the racial superiority angle by having a black protagonist save himself from the sinking Titanic with no lack of ingenuity or coarse language. What makes Down with the Old Canoe an excellent work of cultural analysis as well as of scholarly research is how Biel traces the discourse around the disaster decades after the sinking. He provides an astute reading of Walter Lord’s seminal and subtly modernist book A Night To Remember, which kickstarted a nostalgic cult of buffs and enthusiasts that kept memory of the ship alive until oceanographer Robert Ballard rediscovered the wreck on the ocean floor in 1985 (whose discovery, enabled by military-industrial cooperation, corporate self-promotion, and the sort of technological advancements that the sinking was supposed to have demystified, is dissected as a defining and characterisitic achievement of Reagan-era America). What Biel finds is a gradual calcification of meaning around the event, the assumptions of the traditional, conservative consensus collecting and weighing down its cultural memory like so many barnacles on the ghostly shell of the great liner on the floor of the Atlantic. The Titanic enthusiasts he interviews and the publications they produce evince an unchecked sense of nostalgic yearning for the seemingly less complicated world that they conceive of as vanishing with the great ship. In their love of all things Titanic, the buffs find an outlet for their disdain for and rejection of the fundamentally diverse, post-modern, sexually liberated, pluralistic society that has emerged in America since the 1960s. Unable to act meaningfully to curb the progressive equalization of rights for women and minorities, they instead sink their identities into a bygone era where such equalization was kept firmly in check by a velvet-gloved male hand. 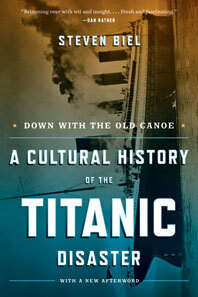 I read the latest edition of Down With the Old Canoe re-released in accordance with the 100th anniversary of the sinking, which included a new afterword tackling the massive cultural success of James Cameron’s epic Oscar-sweeping cinematic treatment of the disaster in 1997 (also the year Biel’s book was first published). What Biel finds most interesting about the film that now defines the event in the collective imagination is that in the hands of the openly liberal Cameron, the disaster becomes an exercise in female self-actualization for Kate Winslet’s upper-crust Rose through her whirlwind doomed romance with Leonardo DiCaprio’s bohemian free spirit Jack. 1500 people have to die so that one young woman can break free of the social chains that bind her. A small price to pay, at least in the movies. But Cameron’s Titanic focuses on this angle in order to refute the conservative implications of the many previous interpretations of the disaster. From Billy Zane’s snobbish cad of a villain to the cameo appearances by multi-millionaires parading ridiculously on deck in coats and tails to “go down like gentlemen”, the upper crust is portrayed as superficial, obsessed with rules and appearances, and so out of touch as to guarantee their own demise in the unforgiving depths. To paraphrase Biel’s afterword to his superb compendium of them, cultural responses to Titanic have long tended to gaze back with yearning at “the good old days” before the ship sank and the world changed for the worse. Cameron’s Titanic saw this order as the “bad old days” and bid it good riddance while humanistically eulogizing the tragic sacrifices its exorcism demanded. Biel examines the cultural history of the disaster with a respect for the former, established perspective with the intellectual principles of the latter, revisionist view, and that is a major factor in its success as scholarship and as a fascinating read.